Imagine you’re deep underwater in the Pacific, working in an underwater lab with a small crew. Suddenly, an event occurs and everything is unraveled. Many of the underground structures are damaged or destroyed. It seems most of the crew has died in the accident. You’re trapped, wandering the seafloor in your suit. Your goal is to reach the surface via an escape pod. You need to keep your oxygen levels in check by finding additional oxygen tanks. There is a limited supply of flares to light the way but you can find more. You are armed with a small utility knife that doesn't do a whole lot! Another factor to staying alive means that you must also survive the dangers that lurk near the dark seafloor. Unique creatures and fish are not always friendly. You must manage and monitor these things all while dealing with the stress and fear of realizing all of your friends and co-workers are gone. Narcosis does a great job immersing you into the creepiness of the dark deep ocean. It really captures the feeling of being lost, desperate and scared. The fear that a sea creature might swim from the dark water and attack, creates tension. Eventually, you start fearing the possibility of what may happen next. The story and voice acting were great. We will let you discover the story on your own but we enjoyed the ending a lot. The puzzles are a mix of easy and hard. A few places near the end of the game got a little confusing. Jen flailed around a long time and eventually figured things out, while Zen got some help from her friend YouTube. Narcosis is marketed as a Survival Horror game but we didn’t find it super scary. There is just the right amount of jump-scares that it keeps you on alert. The creepy underwater setting paired with plenty of threats lends to a lot of suspense and thrills. 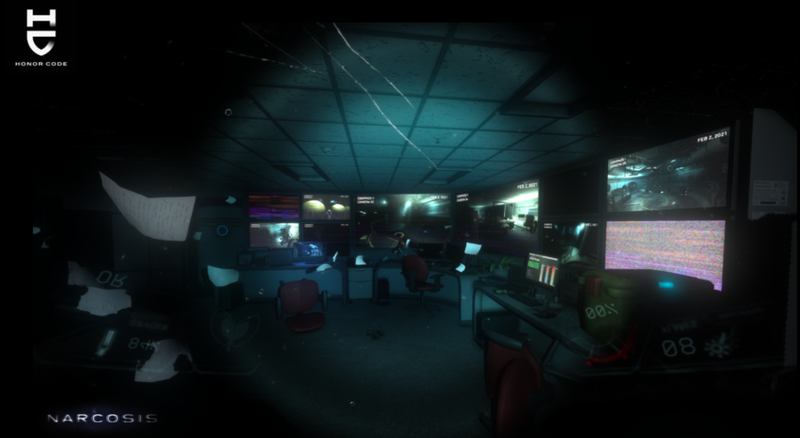 Narcosis is a great creepy game with a survival element. If you enjoyed games like, Layers of Fear, then Narcosis is a game we think you might enjoy. Listen to the full review in the player above or on iTunes.